Select the thumbnail image above for larger sized photo and a PDF file with biographical information which opens in a new window. 9th Battalion the Yorkshire Regiment. Husband of Annie Kennedy, of 2, Kirsop St., Jesmond Vale, Newcastle-on-Tyne. KIlled 11 December 1915. Aged 33. 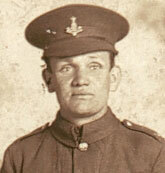 Born Dawdon, Enlisted West Hartlepool, Resided Horden. Buried BREWERY ORCHARD CEMETERY, BOIS-GRENIER. Mark Kennedy (<suzukitl1000s@hotmail.com>), - great-grandson of Corporal Kennedy, has researched his great-grandfather's service with the 9th Battalion. By selecting the thumbnail photo above, or the link below, you can read of Mark Kennedy's research and see a larger photo of Corporal Kennedy.